I belong to a really great list-serve through the Holistic Mom's Network and oddly enough that is where I got the idea for today's post. A mom had written in wondering what she could do for her 5 year old son who was wetting every night. This brought back a few memories of about a year ago when our son seemed to have nightly wetting episodes. People will tell you it's so normal, and that it's a stage, which is all true; but when it's you up every night at 2 am changing sheets and laundering a complete set of bedding every night, you hope there is something to stop the cycle. There is a lot of literature out there about the effectiveness of using Homeopathics and Bach Flower remedies to stop bed wetting and we found the homeopathic Pulsatilla to be invaluable in helping our son quickly get over his issue with bed-wetting. He completely fit the profile for Pulsatilla and it wasn't long after giving him Pulsatilla that we finally had some dry nights. I stopped giving him the Pulsatilla as a test and found that the problem re-occurred soon after. It seemed like forever, but probably after a month or two of no wetting we again stopped giving him the Pulsatilla and he was able to stay dry at night. What a relief. I still believe to this day that he wouldn't have gotten through that stage as quickly without homeopathics. Unlike traditional medicine where there is a one size fits all approach, when you use homeopathics and Bach flower remedies you must find the right remedy for the person you are treating. I can't count the number of times I've heard people say - "Oh, I tried XYZ remedy for teething, homeopathy doesn't work." There are half a dozen remedies to try for teething and each one fits a particular personality and situation. It's not always easy to see yourself or child in a remedy, but a little investigation and perseverance usually pays off. Belladonna - helps the child who sleeps so deeply he cannot wake up. 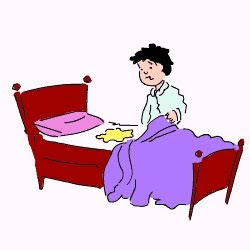 Causticum - helps the child who wets the bed in the first sleep and is worse in dry, clear weather. Kreosotum - helps the child who sleeps so deeply he cannot wake and often has dreams or nightmares involving fire or of being pursued. Pulsatilla - helps the child who is shy, sensitive, weepy and affectionate. Sepia - also helps the child who wets in their first sleep. This child generally loves vigorous exercise and dancing, and is sensitive to cold air. Chicory: due to lack of attention - reduces the child's dependence on the parents at night. Crab Apple: helps overcome a feeling of uncleanliness. When a child is ashamed of his own weaknesses, it becomes harder for him to overcome them. Mimulus: alleviates the anxiety induced by anticipation. Any of the Bach flower remedies can be mixed and taken together. Use a combination of Bach flower remedies and homeopathics to suit your child's needs. You can find Bach flower remedies and homeopathics at your local health store. I also purchase a few homeopathics at 1800homeopathy.com. For those of you going through this stage: Good Luck and remember "This too shall pass"! Labels: Ailments, Bach Flower Remedies, Children's Remedies, Homeopathy, What's in Your Medicine Cabinet?? Wow, this really opened my eyes to some of the reasons my son (5) may be wetting the bed...he is one who sleeps so deeply that he can't wake up. We had an earthquake last year, and he didn't even wake up in the slightest! Also, he has a lot of nightmares exactly like you mentioned of people chasing him or of fire. I had heard that goes hand in hand with deep sleepers. thanks for such an informative post! Thanks for the info. I have a friend who is going through some of this with her son... I'll definitely pass on the link to your blog so she can read it. Hello Alexis and Michelle - glad you found this post useful and I hope it helpsget you and your friend through what can be a difficult stage! Best of Luck! This is definitely a wait and watch and sometimes try another remedy. How do you dose each remedy? Is it OK to combine the homeopathic remedy with the bach? Also, do you know anything about using Cypress Oil?